The area is generally serviced by the town of Fort William which lies on the banks of Loch Linnhe. Fort William is the main district town of Lochaber and is known as the “Outdoor Capital of the UK”. Fort William town is a popular tourist destination and has a wide variety of attractions including the locks at Corpach Basin on the Caledonian Canal which make ideal walking opportunities for the Great Glen Way. There is a variety of shops, a Library, Tourist Information Centre, Museum and Railway Station which has an overnight sleeper to London, links to Mallaig, Glasgow and Edinburgh as well as a Bus Station. There are also services at the nearby village of Caol which has Two General Stores, a Post Office/Newsagents, Chemist, Community Centre and Primary School. Lochaber High School and the Medical Centre are a short walk from Riverside Park. Situated in a peaceful cul-de-sac location in popular residential Lochyside on the outskirts of Fort William. Originally built around 2001 this beautiful, two bedroomed, detached bungalow spans approximately 88 square metres. The property has been well maintained, it is in excellent decorative order through-out and forms a lovely family home. There are stunning views from the living room window to Ben Nevis, Aonach Mor and the surrounding mountains. The property benefits from well proportioned and deceptively spacious living accommodation, double glazing, oil fired heating with the additional benefit of an electric fire in the living room. 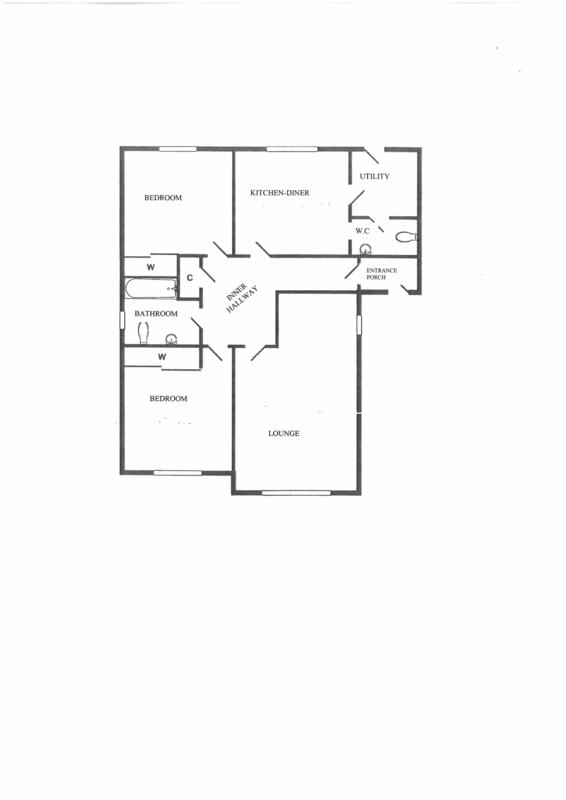 Flooring is predominantly carpet with the exception of the kitchen, utility, W.C and bathroom. There are two generous double bedrooms, each with good storage in the form of built in wardrobes with sliding mirrored doors. 15 glazed panel door with side screen leading into hallway. An “L” shaped hallway with good useable space. Built-in storage cupboard with shelving. Access to loft. 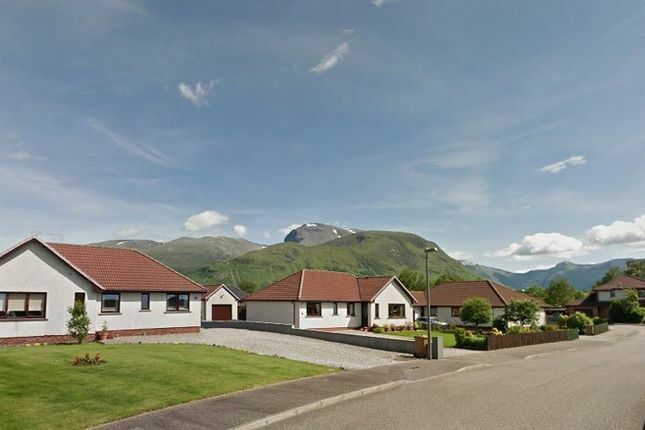 Bright and spacious “L”-shaped room with triple facet window to the front providing fabulous views to Ben Nevis, Aonach Mor and the Nevis Range of mountains. A focal point of the room is an electric fire with marble effect hearth, mantle and wood surround. Rear facing, fitted kitchen-diner with a variety of wall, drawer and base units to include open end display shelving. Integrated appliances include a fridge-freezer, oven, hob with extractor hood and dishwasher. Tiled walls above work surface areas. Access to Utility & W.C. Sink & drainer, plumbing for washing machine, larder style cabinet. Access to W.C and Garden. W.C, wash hand basin, shaver socket and extractor. Fully tiled bathroom suite comprises: WC, wash hand basin with vanity unit below, bath with electric shower and side screen over. Shaver socket. Front facing enjoying views towards Ben Nevis and the surround hillside. Built-in wardrobe with mirrored sliding doors. Built-in wardrobe with mirrored sliding doors. There is open access to the front of the property which is divided by an area of grass and an area of stone chippings which provide for off street parking and access to the garage. The garage has shelving, power supply, lighting and a personal door to the rear. From the rear there is disability access by way of a ramp and handrail into the property. The rear garden is divided with stone chippings and grass and to the side of the property there is a small variety of plants and shrubs.